A Regional Sales Consultant not only creates new business pipeline but also help the company in attracting, retaining and developing their sales workforce. 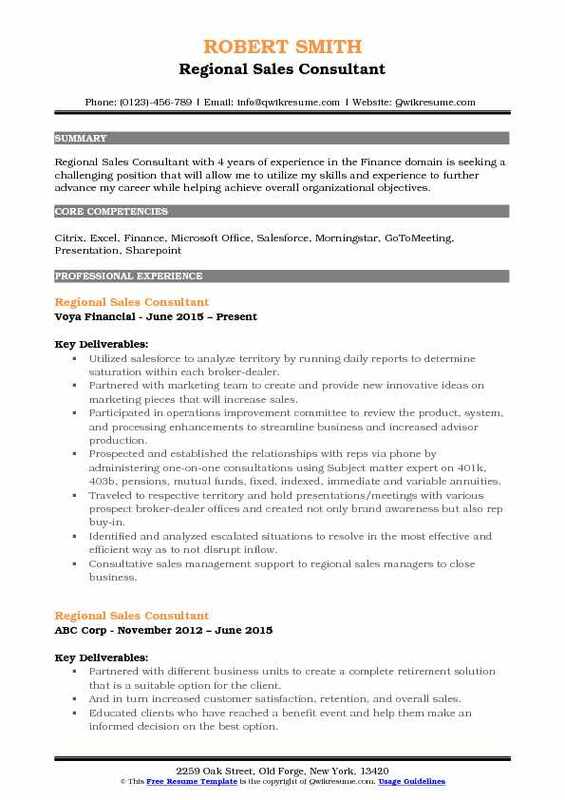 As Regional Sales Consultants, these professionals are involved in dispersing the following roles and responsibilities – finding and developing new leads, converting prospects into leads, leading sales calls, identifying client needs, matching client needs with revenue opportunities, strategic planning, collaborating with other team members, networking constantly with clients, researching competitors activities and drafting regional sales report periodically. A regional sales consultant should have a great selling passion, they should be able to exceed sales quota, be a self-starter, dedicated achiever, and a game changer. The person should show proficiency in software like CRM, SAS, and SPSS; such professionals should also exhibit their skills in data interpretation and communication. 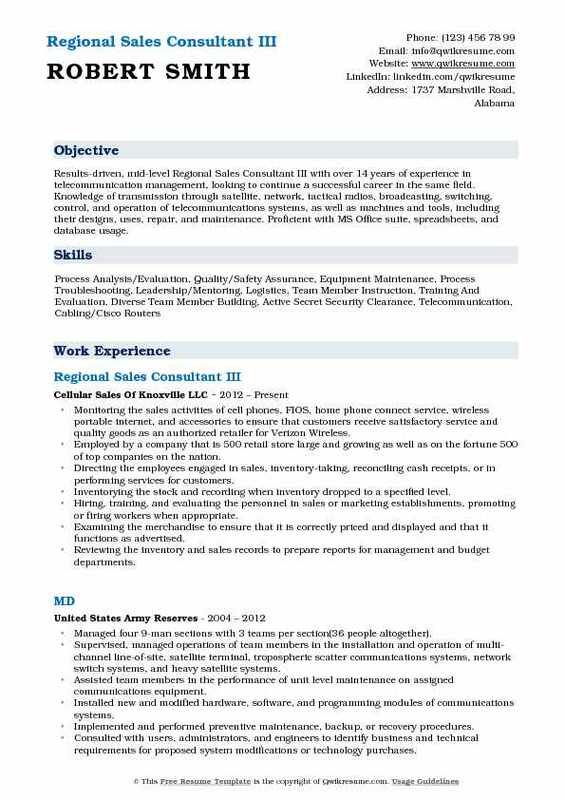 Regional Sales Consultant Resume should include a degree in sales or marketing with few years of related experience and traveling abilities. 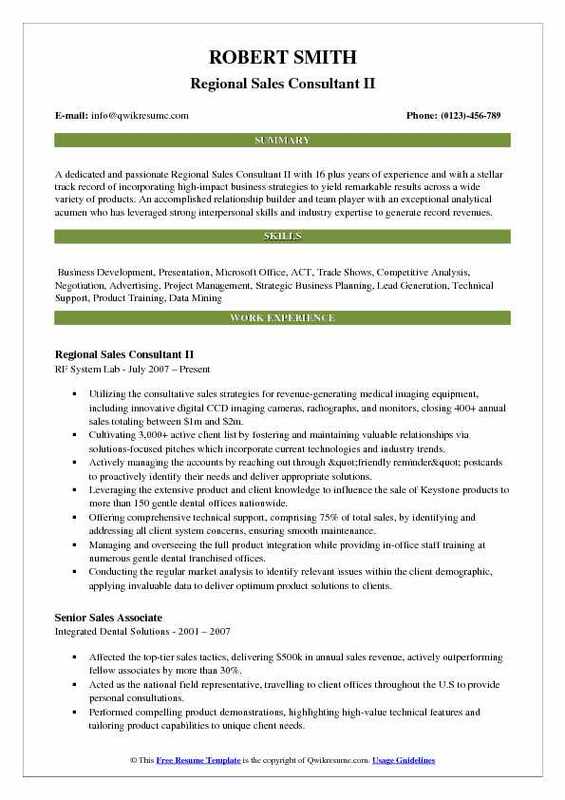 Objective : Regional Sales Consultant 3 years of experience in the Finance domain, with strong leadership, communication, and interpersonal skills. Leverages coaching skills and consultative selling techniques to build relationships, uncover opportunities, overcome objections, and drive sales. Supports partners in the field from home office, managing calendar, marketing initiatives, and business submission process. Delivers on the promise of exceptional client experience and sales execution. Cultivated, managed, and expanded relationships with independent financial advisors across the Great Lakes Territory. Partnered with the external wholesaler to co-create marketing initiatives, to grow product awareness, interest, and adoption, resulting in cumulative territory sales of $800 million. Reviewed advisors existing books of assets for opportunities to increase clients guaranteed income. Partnered with advisors in competitive situations to compare and contrast Prudential's suite of products. Segmented advisor base focusing on most valuable relationships and delivered specific, actionable services. Cross-referenced new contacts on CRM tools, advisor databases, and social media to determine fit and initiated proactive outreach. Used webinars to present products and platforms to foster adoption and engagement among advisors. Supported advisors through the entire sales process, assisting in presentation and positioning of products, application submission, facilitation of fund transfers, and servicing of existing, in-force contracts. Shared best practices and presented successful sales ideas. Participated in voluntary idea-sharing. Summary : Regional Sales Consultant I with 12 plus years of experience in the Finance domain is seeking to obtain a position that provides the opportunity to enhance my professional skills while advancing my career goals in sales. 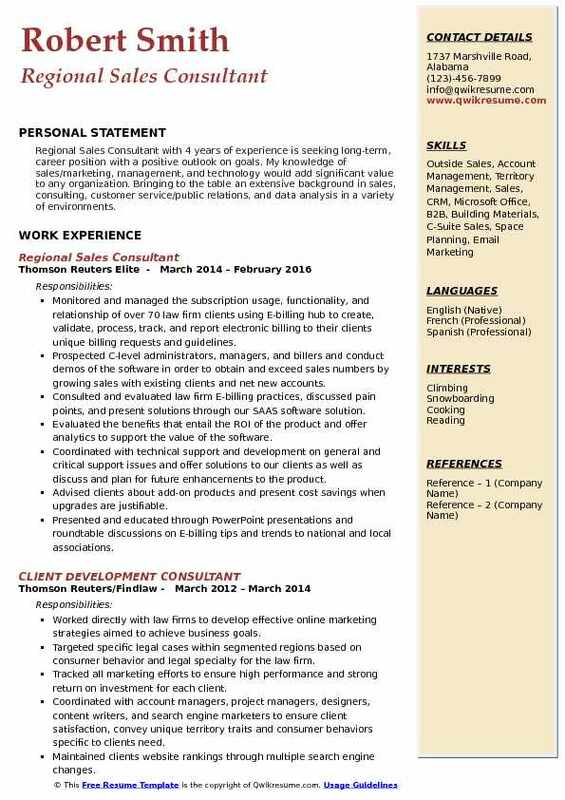 Skills : MS Office (Word, Excel, Access), MS PowerPoint, Visio, MS Project Series 6, 63 PA Life Insurance. Facilitating the sales with multiple responsibilities as an internal wholesaler for the prudential variable annuity product line. Managing the sales of $100 million and maintaining relationships with over 300 financial advisors. Helping the financial advisors create retirement income solutions for their clients based on needs-based analysis that would include the annuity product along with other financial instruments as well as developing marketing strategies for agents. Collaborating with the external wholesaler to manage a territory and efficiently communicating the annuity sales and sales ideas to clients. Analyzing the opportunities and communicated, as appropriate, the timely opportunities of underlying fund managers including Alliance Bernstein, Franklin Templeton, Schroders, and UBS Funds. Providing an expert product knowledge and support to the clients, the financial advisors in two large producing territories. Participating in sales calls and live meetings between the financial advisor and their clients. Creating comparisons between the Prudential variable annuity and the competition with a focus on performance, cash flow generated, and account values and fees. Summary : A dedicated and passionate Regional Sales Consultant II with 16 plus years of experience and with a stellar track record of incorporating high-impact business strategies to yield remarkable results across a wide variety of products. An accomplished relationship builder and team player with an exceptional analytical acumen who has leveraged strong interpersonal skills and industry expertise to generate record revenues. Utilizing the consultative sales strategies for revenue-generating medical imaging equipment, including innovative digital CCD imaging cameras, radiographs, and monitors, closing 400+ annual sales totaling between $1m and $2m. Cultivating 3,000+ active client list by fostering and maintaining valuable relationships via solutions-focused pitches which incorporate current technologies and industry trends. Actively managing the accounts by reaching out through "friendly reminder" postcards to proactively identify their needs and deliver appropriate solutions. Leveraging the extensive product and client knowledge to influence the sale of Keystone products to more than 150 gentle dental offices nationwide. Offering comprehensive technical support, comprising 75% of total sales, by identifying and addressing all client system concerns, ensuring smooth maintenance. Managing and overseeing the full product integration while providing in-office staff training at numerous gentle dental franchised offices. Conducting the regular market analysis to identify relevant issues within the client demographic, applying invaluable data to deliver optimum product solutions to clients. 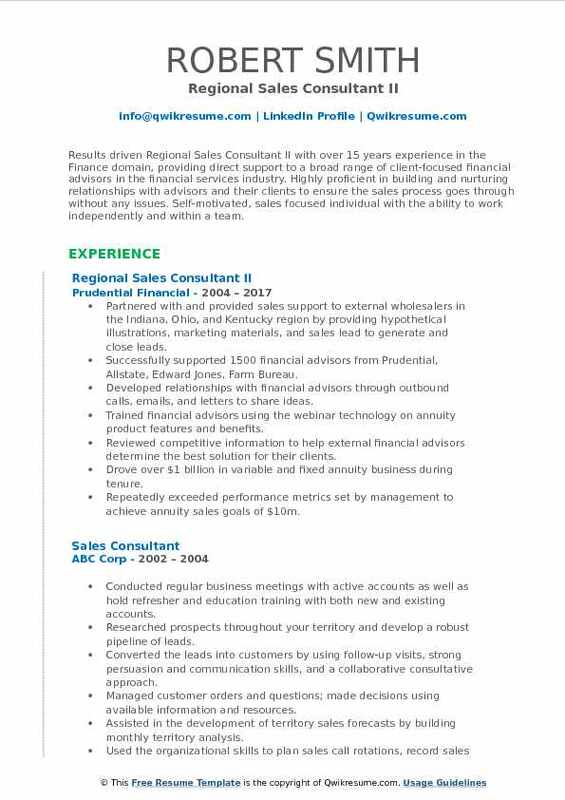 Summary : Results driven Regional Sales Consultant II with over 15 years experience in the Finance domain, providing direct support to a broad range of client-focused financial advisors in the financial services industry. Highly proficient in building and nurturing relationships with advisors and their clients to ensure the sales process goes through without any issues. Self-motivated, sales focused individual with the ability to work independently and within a team. Skills : Relationship Development, Organization, and Prioritization, Relationship Management, Annuities, Sales Support, Investment Products, Product Training, Competitive Analysis. Partnered with and provided sales support to external wholesalers in the Indiana, Ohio, and Kentucky region by providing hypothetical illustrations, marketing materials, and sales lead to generate and close leads. Successfully supported 1500 financial advisors from Prudential, Allstate, Edward Jones, Farm Bureau. Developed relationships with financial advisors through outbound calls, emails, and letters to share ideas. Trained financial advisors using the webinar technology on annuity product features and benefits. Reviewed competitive information to help external financial advisors determine the best solution for their clients. Drove over $1 billion in variable and fixed annuity business during tenure. Repeatedly exceeded performance metrics set by management to achieve annuity sales goals of $10m. Supervised financial transactions with financial advisors of all levels on an as-needed basis. Mentored 5 subordinates resulting in promotion to regional sales consultant positions. 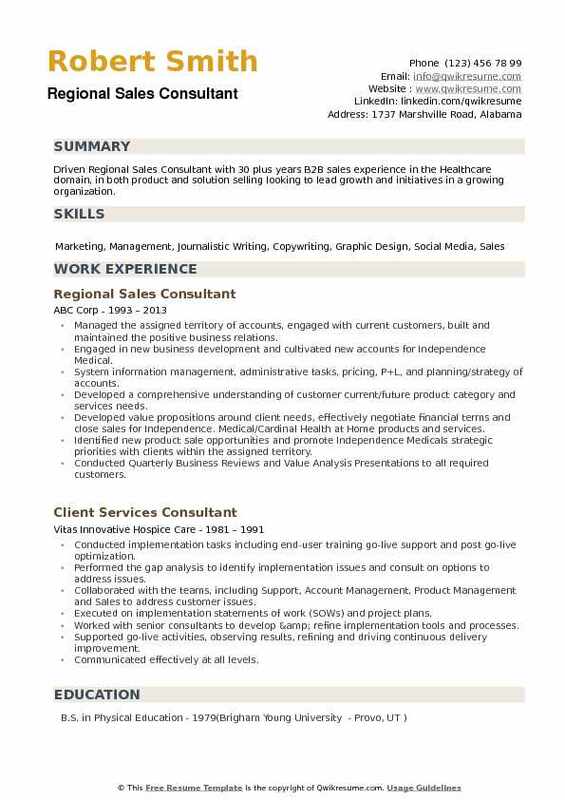 Summary : Dedicated and highly efficient Senior Regional Sales Consultant, with over 9 years of direct sales experience in the Healthcare domain and proven track record in marketing and branding of medical technology. Looking to join an effective sales team and employ innovative strategies in order to maximize company profitability and sales performance. Selling the surgical capital equipment and compatible disposable attachments for soft tissue cutting with hemostasis (Lightforce gold laser and compatible fiber optic laser power touch delivery systems) into 14 hospitals and 4 surgery centers. Calling on surgeons specializing in Otolaryngology, Gynecology, Neurology, and General. Call points include O.R Managers, O.R. Directors, Directors of hospital surgical services and CEOs. Coordinating the placement and transaction of surgery equipment with hospital administration. Holding the equipment demonstrations in hospital operating rooms to present, educate and sell to new physicians. Providing continuing education courses to nursing teams of customer hospitals/surgery centers to educate them on current and upcoming products. Communicating with materials managers regarding surgery schedules to maintain and up sale monthly stock of disposable product in hospitals/surgery centers. Coordinating and developing the sales tactics with senior management based on customer feedback. Representing the company at national exhibitions, presentations, and meetings with market leaders and clients. Summary : Results-driven, mid-level Regional Sales Consultant III with over 14 years of experience in telecommunication management, looking to continue a successful career in the same field. Knowledge of transmission through satellite, network, tactical radios, broadcasting, switching, control, and operation of telecommunications systems, as well as machines and tools, including their designs, uses, repair, and maintenance. 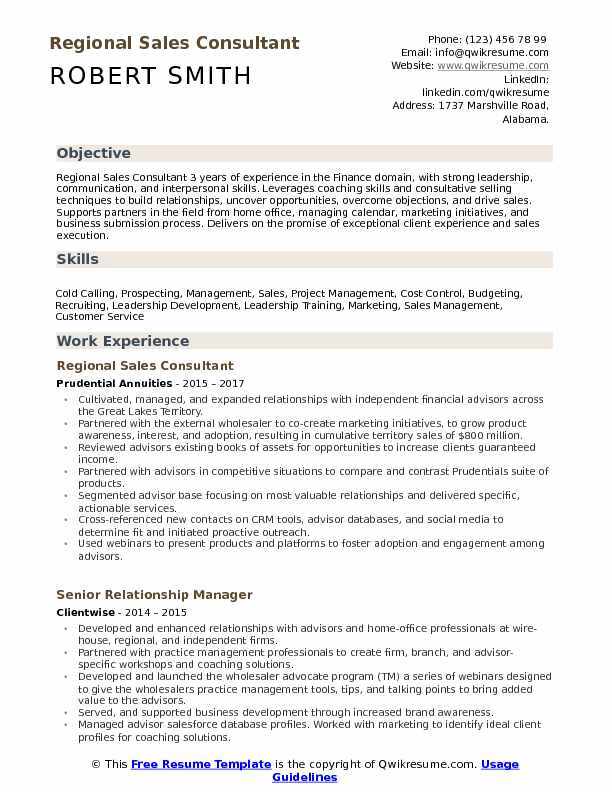 Proficient with MS Office suite, spreadsheets, and database usage. Monitoring the sales activities of cell phones, FIOS, home phone connect service, wireless portable internet, and accessories to ensure that customers receive satisfactory service and quality goods as an authorized retailer for Verizon Wireless. Employed by a company that is 500 retail store large and growing as well as on the fortune 500 of top companies on the nation. Directing the employees engaged in sales, inventory-taking, reconciling cash receipts, or in performing services for customers. Inventorying the stock and recording when inventory dropped to a specified level. Hiring, training, and evaluating the personnel in sales or marketing establishments, promoting or firing workers when appropriate. Examining the merchandise to ensure that it is correctly priced and displayed and that it functions as advertised. Reviewing the inventory and sales records to prepare reports for management and budget departments. Selecting the correct products or assisted customers in making product selections, based on customers needs, product specifications, and applicable regulations. 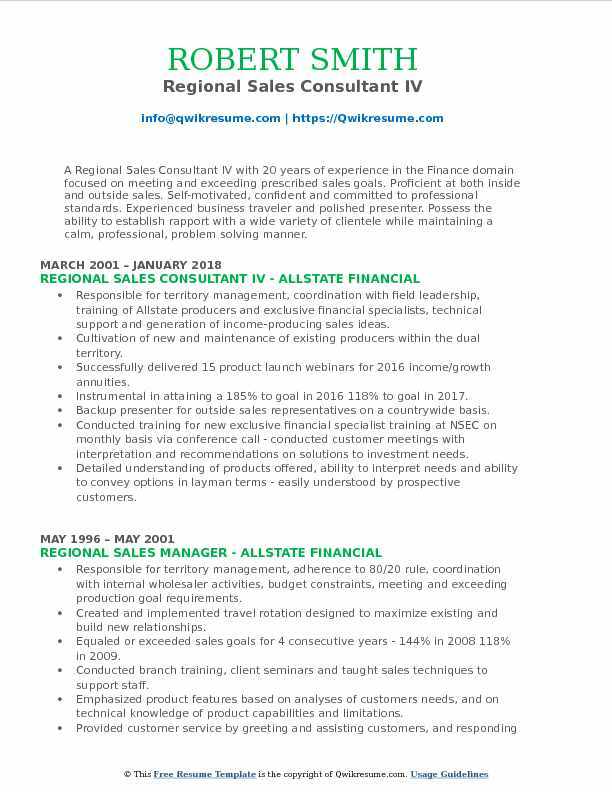 Summary : A Regional Sales Consultant IV with 20 years of experience in the Finance domain focused on meeting and exceeding prescribed sales goals. 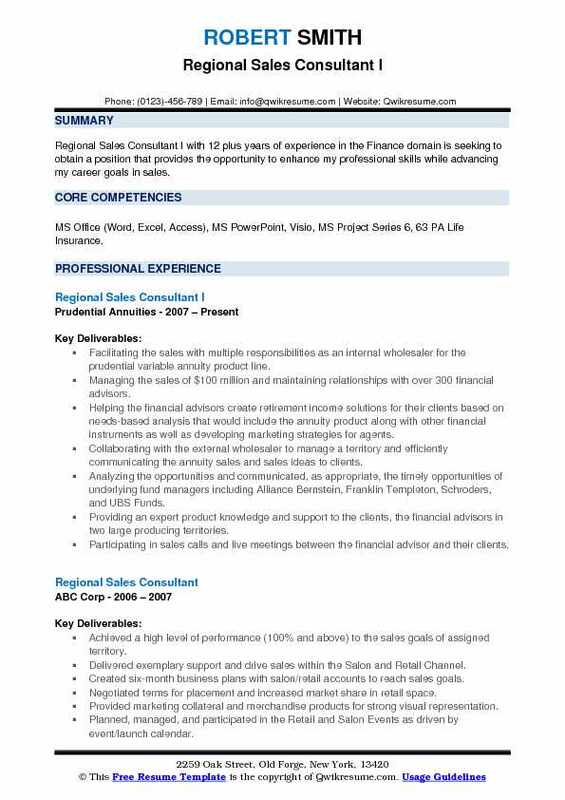 Proficient at both inside and outside sales. Self-motivated, confident and committed to professional standards. Experienced business traveler and polished presenter. Possess the ability to establish rapport with a wide variety of clientele while maintaining a calm, professional, problem solving manner. Responsible for territory management, coordination with field leadership, training of Allstate producers and exclusive financial specialists, technical support and generation of income-producing sales ideas. Cultivation of new and maintenance of existing producers within the dual territory. Successfully delivered 15 product launch webinars for 2016 income/growth annuities. Instrumental in attaining a 185% to goal in 2016 118% to goal in 2017. Backup presenter for outside sales representatives on a countrywide basis. Conducted training for new exclusive financial specialist training at NSEC on monthly basis via conference call - conducted customer meetings with interpretation and recommendations on solutions to investment needs. Detailed understanding of products offered, ability to interpret needs and ability to convey options in layman terms - easily understood by prospective customers. Objective : Regional Sales Consultant with 4 years of experience in the Finance domain is seeking a challenging position that will allow me to utilize my skills and experience to further advance my career while helping achieve overall organizational objectives. Utilized salesforce to analyze territory by running daily reports to determine saturation within each broker-dealer. Partnered with marketing team to create and provide new innovative ideas on marketing pieces that will increase sales. Participated in operations improvement committee to review the product, system, and processing enhancements to streamline business and increased advisor production. Prospected and established the relationships with reps via phone by administering one-on-one consultations using Subject matter expert on 401k, 403b, pensions, mutual funds, fixed, indexed, immediate and variable annuities. Traveled to respective territory and hold presentations/meetings with various prospect broker-dealer offices and created not only brand awareness but also rep buy-in. Identified and analyzed escalated situations to resolve in the most effective and efficient way as to not disrupt inflow. Consultative sales management support to regional sales managers to close business. Objective : Regional Sales Consultant with 4 years of experience is seeking long-term, career position with a positive outlook on goals. My knowledge of sales/marketing, management, and technology would add significant value to any organization. Bringing to the table an extensive background in sales, consulting, customer service/public relations, and data analysis in a variety of environments. Monitored and managed the subscription usage, functionality, and relationship of over 70 law firm clients using E-billing hub to create, validate, process, track, and report electronic billing to their clients' unique billing requests and guidelines. Prospected C-level administrators, managers, and billers and conduct demos of the software in order to obtain and exceed sales numbers by growing sales with existing clients and net new accounts. Consulted and evaluated law firm E-billing practices, discussed pain points, and present solutions through our SAAS software solution. Evaluated the benefits that entail the ROI of the product and offer analytics to support the value of the software. Coordinated with technical support and development on general and critical support issues and offer solutions to our clients as well as discuss and plan for future enhancements to the product. Advised clients about add-on products and present cost savings when upgrades are justifiable. Presented and educated through PowerPoint presentations and roundtable discussions on E-billing tips and trends to national and local associations. Facilitated sales and informed other sales representative partners from Thomson Reuters, elites enterprise and 3e software packages to an Aderant enterprise, Juris, Prolaw, and other time and billing systems on new features and selling points of E-Billing hub to create sales opportunities and offered solutions for mutual clients and prospects. 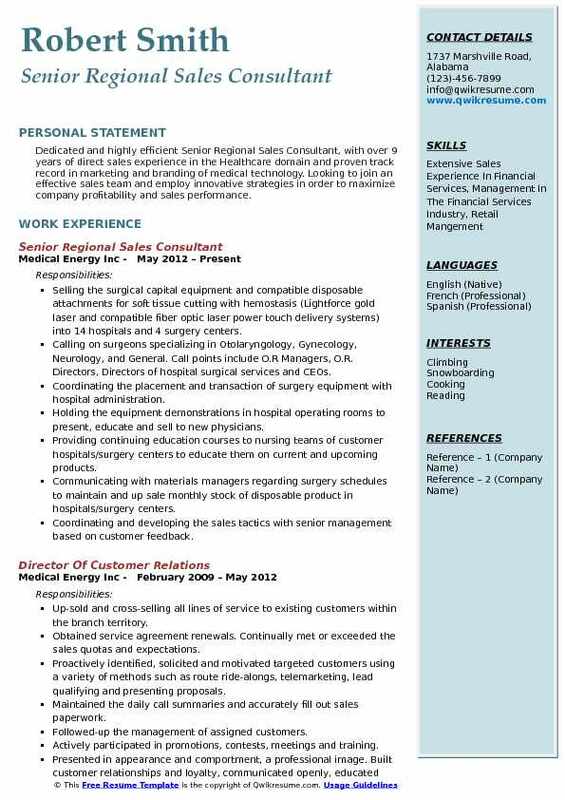 Summary : Driven Regional Sales Consultant with 30 plus years B2B sales experience in the Healthcare domain, in both product and solution selling looking to lead growth and initiatives in a growing organization. Managed the assigned territory of accounts, engaged with current customers, built and maintained the positive business relations. Engaged in new business development and cultivated new accounts for Independence Medical. System information management, administrative tasks, pricing, P+L, and planning/strategy of accounts. Developed a comprehensive understanding of customer current/future product category and services needs. Developed value propositions around client needs, effectively negotiate financial terms and close sales for Independence. Medical/Cardinal Health at Home products and services. Identified new product sale opportunities and promote Independence Medical's strategic priorities with clients within the assigned territory. Conducted Quarterly Business Reviews and Value Analysis Presentations to all required customers.